What colors are dominant in your closet? If you are anything like me, your closet would be filled with black and a few white and navy garments. Although I am not afraid to wear color, I have gotten used to my neutrals. They are safe, easy to style and found heavily in business attire. 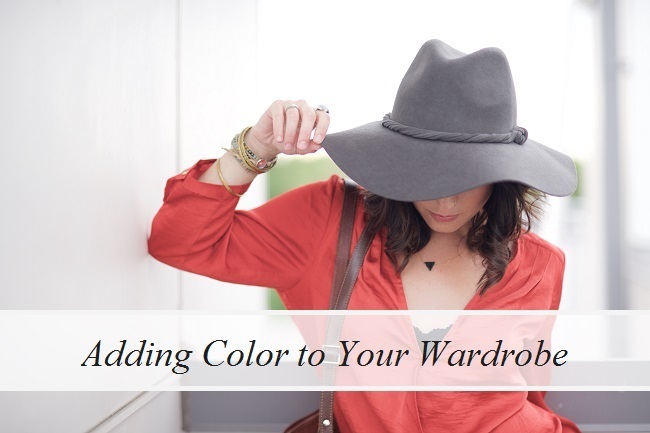 But, what if you have realized that you are missing color in your life and want to try it, but are not sure how to add it to your wardrobe without being totally overwhelmed? It's actually easier than you might think! If you are afraid to incorporate color into your outfits, as a fashion stylist, I recommend to simply start small! Add a bright handbag, shoe or a statement necklace, and as you become more comfortable, start pairing your neutral and black wardrobe with items of color. Yes, it's really that simple, and before you know it, your confidence will sky rocket! Now the important part is that you feel comfortable with what you are wearing. If you are not happy with what you have on, it will show, so make sure the wardrobe fits well and looks right on your body type.